Well designed and maintained holding yards will maximise cow flow, eliminate the need for milkers to leave the pit, and minimise lameness. Increased work efficiency and reduced stress as cows have the chance to organise themselves into their correct milking order. No hindrances or obstructions to the smooth flow of stock, reducing injuries. 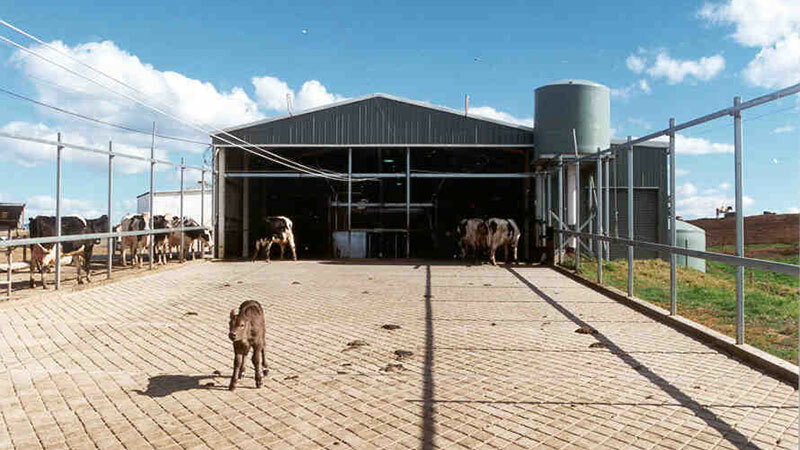 Yards need to be designed in a way that allows cows to enter the yard calmly and have sufficient space for them to arrange themselves into their milking order. Rectangular or circular yards - which is best? Click here for the advantages of a circular yard. Good cow flow if cows enter from appropriate place. Easier to clean with central hose. Can support auto backing gate and cleaning system. Well suited for split herd milking; good for seperating groups and cuttint out cows. If yard is a full circle it can hold a second herd with a second backing gate. Need to have a radius greater than 10m for herringbones and 12m for rotaries. If cows’ heads are raised in the yard, they are too crowded. This may be due to inappropriate use of the backing gate or a yard that is too small. How big should your yard be? Cows correctly held in a yard. This allows them to keep their heads down without forced interactions and they can move into their milking order. Calculate the maximum sized mob which will need yarding. Multiply by the space required per cow. 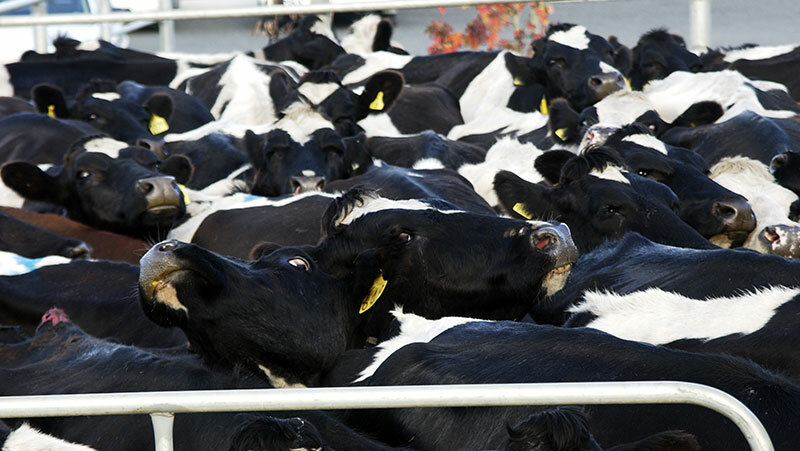 Depending on the average cow size this can be between 1.2 m2 (Jersey) to 1.5 m2 (large Friesian). Most New Zealand cows will be at the smaller end of the spectrum. Cows too tight in a yard. This will lead to stress, bullying and lameness. Once the total yard area has been determined then the dimensions of different shaped yards can be calculated. For a 400 jersey herd in a circular yard. The best place for cows to enter the yard is from the rear. If cows can fill the yard in the same order they come in from the paddock, they will flow better into the yard and dairy. 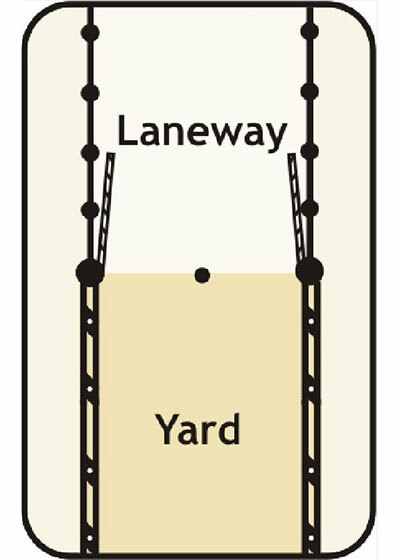 Entry into the side of the yard may be necessary due to the position of the tracks although good cow flow can still be achieved if the entry is near the rear of the yard and cows have time and space to quickly arrange themselves into their milking order. Recommended entry to round yard. Rear access to rectangular yard. Widen the race by 2 metres before it connects with the yard. This can often become a congestion point, especially if there is a kerb. 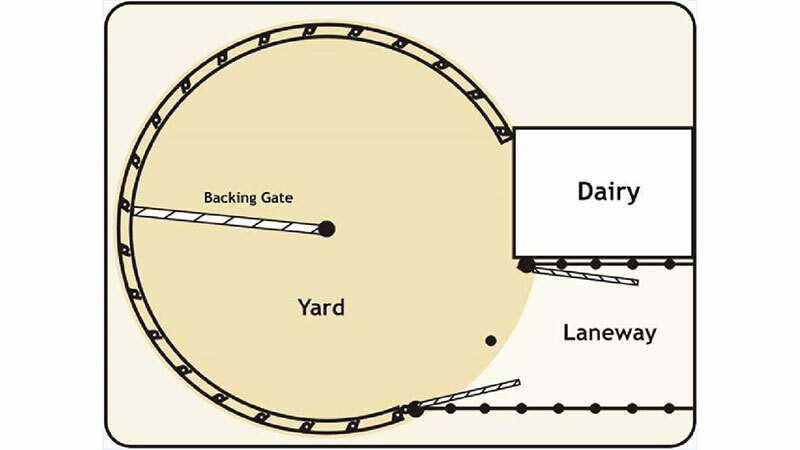 Tapering the yard towards the dairy entrance can aid cow flow. It eliminates dead corners and cows are spaced for smooth entry to the dairy. When laying new concrete, use stamping, trowelling, rolling, or brush with a coarse broom to provide traction. Narrow vertical gaps in the fencing allows easy access and escape for people. Consider additional facilities during the yard design stage – this ensures the yarding system can cope with the full range of activities required. If correctly positioned, the race, crush and loading ramp can all fit in. Hoof wear can be reduced by providing cushioning on the areas where cows turn. Several matting options are available which provide cushioning, traction and durability. Scabbling or texturing of hardened concrete to improve traction can be done through experienced concrete contractors. Scabbling creates a safe and durable surface through the mechanical hammering of chips out of concrete. It can be done on both existing and new yards. Cutting through diamond grooving provides better traction than parallel grooving. For effective traction, diamonds need to have centres of 75mm or less. Single slope yard with grooving all running down slope. The amount of manure deposited on the yard is related to the time the cows spend there and stress levels. 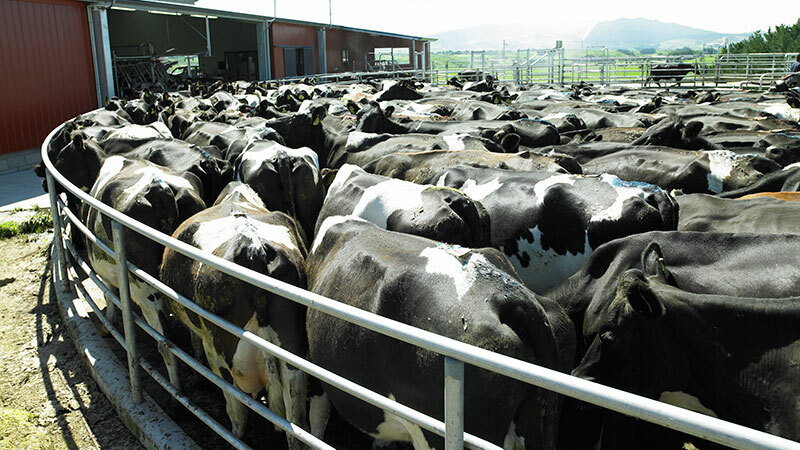 An efficient milking regime will minimise cow time in the yard. Pre-wetting the yard surface will speed up the yard cleaning process. Scraping the yard surface with backing gate attachments such as a Dung Buster will reduce the amount of water needed to remove manure.